168lbs champion James DeGale speaks for the first time on a injury he has been carrying behind the scenes. 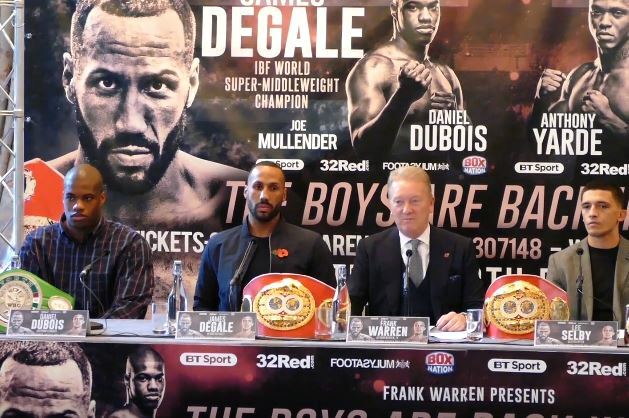 James ‘Chunky’ DeGale returns to his home country of Britain for the first time in some time when he boxes on an action packed December 9th card at the Copper Box Arena in London. The show will also feature world champion Lee Selby of Wales. It will mark the first time since all the way back in 2014 that Olympic Gold medallist James DeGale has fought on home soil. Since then, he’s but together three wins and a draw on his resume between fighting in the US and Canada against Andre Dirrell, Lucian Bute, ‘Porky’ Medina and most recently last January at the Barclays Centre in New York he drew with Badou Jack. “I’ve done alright but there’s so much more to come. Since the Medina fight I’ve been boxing one armed. So it just shows you how good I am. I’m a right-handed southpaw. Everything comes off my front hand. I couldn’t do it. I couldn’t throw the right hook. I couldn’t double up on my jab. So it’s been frustrating but it just shows you how good I am. The super-middleweight division is on fire world-wide at the moment. In the UK alone as part of the current World Boxing Super Series the likes of George Groves, Callum Smith and Chris Eubank Jr all offer big future fights for DeGale.